Targeting potential customers who are 'late' in the buying cycle with long tail keywords, with Wordtracker - the leading keyword research tool. Take the 7-day free trial. Seasoned professionals in the arena of online marketing know it's clever to use keywords that target potential customers who are "late" in the buying cycle. So, how do you find out what these keywords are? ...and why are they so important? In professional terms, what we are talking about here is the concept of targeting so-called long tail keywords. Long tail keywords are those three and four keyword phrases which are very, very specific to whatever you are selling. You see, whenever a customer uses a highly specific search phrase, they tend to be looking for exactly what they are actually going to buy. In virtually every case, such very specific searches are far more likely to convert to sales than general generic searches that tend to be geared more toward the type of research that consumers typically do prior to making a buying decision. To help illustrate this phenomenon, let's take a look at the typical step-by-step buying path that a customer travels on the way to a making a purchase. Consumer becomes aware of a product. Consumer seeks information about that product in preparation for possible purchase. Consumer evaluates alternatives to product (features, pricing, etc...). Consumer makes their purchase decision. Consumer pulls out their credit card and completes the transaction. Consumer then evaluates the product after buying it and decides if they want to keep or return it. ...because once they have made their decision to buy something, that's when they start using very specific search phrases to seek out their target purchase. Highly specific multi-word phrases tend to be far easier to rank well for than the more generic single keyword or double keyword phrases. Here's a specific example. Let's say your site sells guided mountain climbing tours in California. At first, you might consider targeting a generic phrase like travel. After all, an adventure tour is generally the type of excursion people like to participate in while traveling on vacation. However, if you tried to go after that phrase, you'd be facing direct competition from big sites like Yahoo.com, CNN.com and Travelocity.com. It's unlikely you'd be able to knock any of those sites out of the top ten unless you're willing to invest a pile of money and a mountain of time. "I'm looking for someone who sells guided tours for beginners to climb Mount Shasta so I can take my family on a fun trip this summer." If they were, they'd be entering something other than travel. Even if you were to target a more specific phrase like mountain climbing you'd still be up against heavy hitters like About.com, Wikipedia.org, and the USDA forest service. And, unless you sell everything related to mountain climbing for every mountain around the world, the traffic you'd get for that keyword isn't likely to convert to many sales. So let's look at some of the keywords that are specific to what you're selling — keywords that you can start ranking for and generating traffic and sales right away. 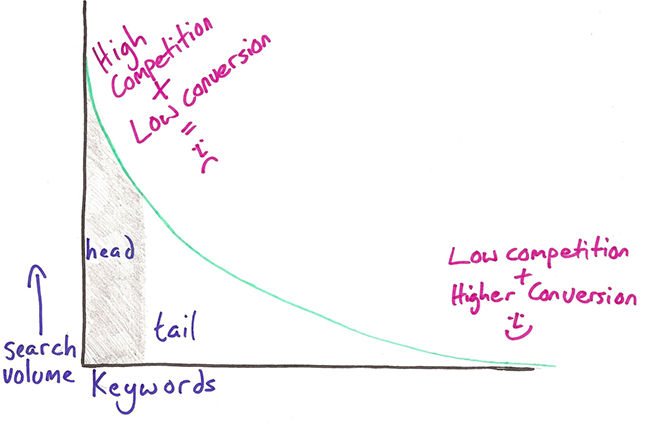 The long tail keywords are much easier to rank for. People who search by using long tail keywords are far more likely to become buyers! Of course this suggests that you should be creating pages that zero in on snagging searchers who use long tail keywords. And, since there are potentially so many different long tail combinations that searchers may use to buy what you offer, that means you'll likely be creating more pages. Well, the goods news is that Google likes sites that have more pages. It makes the site look more substantial, more natural, and even more real in the eyes of the world's most popular search engine. Bear in mind that your "unique" pages need only be variants of your main offering(s) but focused on a specific long tail niche. Therefore, each and every page will have a unique title, description meta tag, h1 header tag, and body content that emphasizes your offering by using the long tail keyword that you choose for each specific page. It isn't rocket science, but it sure does work well to snag consumers at the optimum stage of the buying process! So, instead of focusing on just two or three highly competitive general keywords, target the dozens or even hundreds of easy-to-rank-for long tail keywords. a large number of pages with each sending you small amounts of highly targeted traffic. But overall, it's best to think of it this way; would you rather rank for one keyword which sent you 1000 visitors a day or 200 keyphrases, half of which sent you 1 buyer a day? After you do the math you'll see that 100 buyers are much better than 1000 site visitors who are only doing research. And there is no question that the use of ultra-specific keywords demonstrate a greater intent to buy on the part of the customer. This simply leads to more sales which is, of course, what you are really after. In the end there is no substitute for doing your keyword research and determining which keywords have enough traffic to make them worth going after. And this effort must be dovetailed with doing your competitive intelligence research to determine which keywords you'll be able to rank for based on the sites you'd have to compete against. Of course, Wordtracker is the hands-down best place to find a huge list of related keywords as well as learn how much traffic each is likely to provide your site. For many of the sites we manage, at least half of our customer traffic comes from these longer, more specific phrases — and such traffic tends to convert at a much higher level than generic one or two-word keyword phrases. ...all of which will certainly lead to a much more profitable bottom line! Find more of the three and four keyword phrases which are very, very specific to whatever you are selling. Dig much deeper into the long tail of a primary phrase: for every search, Wordtracker gives you 1,000 keywords. See competition data for each keyword, enabling you to cherry-pick the most promising keywords. Generate thousands of relevant keywords to improve your organic and PPC search campaigns. Optimize your website content by using the most popular keywords for your product and services. Research online markets, find niche opportunities and exploit them before your competitors.